The K09 Mini Paring Knife’s 2.25-inch blade has a straight cutting edge and a sharp point that provide extreme control during detailed cutting tasks. These qualities make it the tool of choice for paring, carving decorative garnishes, and other food preparation chores that require precise control. Like the original version, it features a Plain Edge MBS-26 stainless steel blade, ground exceptionally thin and meticulously heat treated for optimal cutting performance. 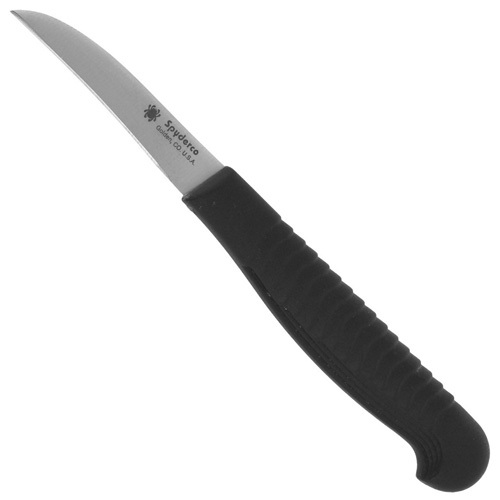 Its durable black polypropylene plastic handle is injection molded directly onto the tang of the blade and features a distinctive “stepped” texture pattern that offers both comfort and control during use.